The wide plate straightener from GHD. The GHD Wide hair straightener has the same great features as the standard width GHD MK4. This makes the latest GHD Wide straighteners one of the most advanced hair straighteners available today. The GHD Wide has an improved rounded barrel for better curling and styling, it automatically adjusts for international voltages so can now be used anywhere. The new sleep mode turns the straighteners off should you forget. The new Shiver Mode protects the straighteners from damages due to condensation so at temperatures below 5 degrees they will turn off. 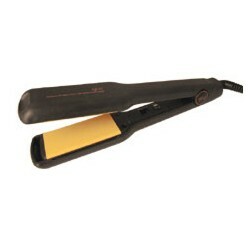 These are official GHD hair straighteners from an approved stockist and are covered by the full manufactures guarantee. If you register your new GHD Wide straighteners online you can extend the standard 12 months guarantee to a full two years giving you even greater peace of mind. Check availability and best price of the GHD Wide below.